Secretary of State Hillary Clinton, in conjunction with the office of special representative to Afghanistan and Pakistan Richard Holbrooke, is about five days into an experiment mobile phones to build civil society in Pakistan. Working with three local cell phone companies and a U.S.-based mobile vendor, the State Department has set up in Pakistan what it is calling Humari Awaz. That's "Our Voice" in what seems to be Urdu. Here, in brief, is how it works: Pakistanis text in keywords to the network via the short code 7111, and those phrases are used to spontaneously create texting-based social lists -- around the day's price for cotton, the latest cricket scores, a community radio station's fan base, or perhaps the desire for less extremist political leadership. The State Department is covering the cost of the first 24 million texts to Humari Awaz. How long that reserve will last remains to be seen. Less than a week in, and more than half a million SMS messages have been sent over the State-sponsored mobile network thus far. Visit ProPakistani for a taste of some of the suspicions and concerns the plan is raising in that country. 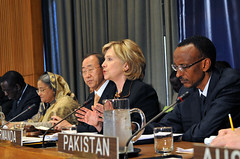 The Humari Awaz project is part of the Clinton State Department's push toward what it calls "21st century statecraft." In related news, Secretary Clinton recently announced while in Morocco that State was launching a "Civil Society 2.0" initiative, centered around providing education and training on the building blocks of digital literacy -- building a website, working with text messages, blogging, using a social network to create social change, and more. Clinton also announced $5 million in CS2.0 monies to be dedicated to "bolster[ing] the new media and networking capabilities of civil society organizations and promot[ing] online learning" in the Middle East and North Africa.